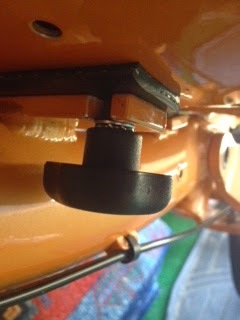 So, a customer (David D.) with a Cruzbike Quest 26 found himself with a problem none of us had encountered before. Basically, it was this. There are a few thick hard rubber pads between the seat and the mounting plates. The pads were slowly migrating out of position. The customer (David D.), was understandably concerned that he might lose the pads someday and, thereby, their functionality. We didn’t have a factory authorized solution, but had a shop solution (Gorilla Glue the pads to the seat). David was looking for a solution that was more elegant, perhaps, and less fixed. He wrote me the other day to tell me about it and I think it’s a brilliant and creative “Home Depot” solution, truly worthy of a Cruzbike rider. I love the resourcefulness he shows here. If anyone else has a similar issue, perhaps you’ll find this helpful! Thank you for your help. I thought you would like to know that I believe I have found a solution to my issue of shifting rubber pads under the quest seat. To replace the pads, I found at the hardware store a large rubber hose. This is the hose used to drain a clothes washer. The wall thickness was roughly the same as the pads. By heating it in boiling water I was able to flatten it and cut it as a single piece slightly larger than the bracket that the seat mounts on. By having a single pad that both screws pass through this pad will not be able to shift while riding. To address the issue of the screws loosening I added a star locking washer. This seems to result in stable seat attachment and still allows for an easy seat release that I need for placing my bike on my car rack.